This will be my sewing line. 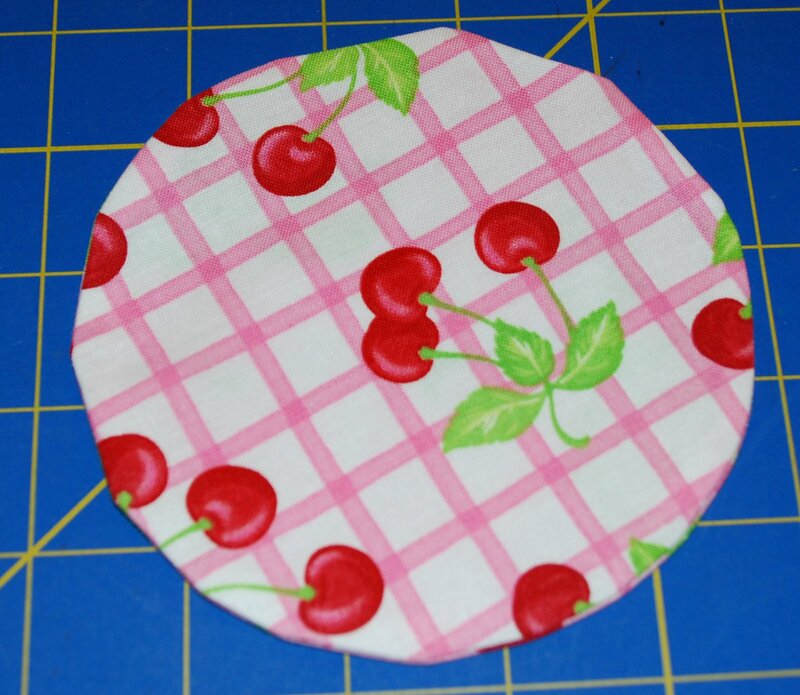 I pin my charms right sides together to prevent slipping of the fabric as I sew the circle. I recommend changing your stitch length to 1.5 instead of 2.2 or 2.5. I have found it will allow you to sew with out moving your presser foot up and down as often. Make sure to leave an opening for turning. 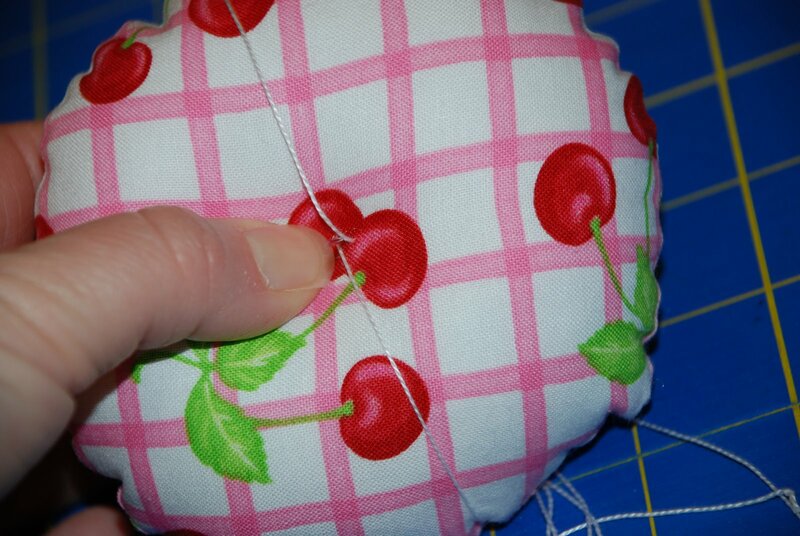 I usually backstitch at the beginning and end of stitching to lock those stitches…to allow for a smoother finished look to the pincushion. 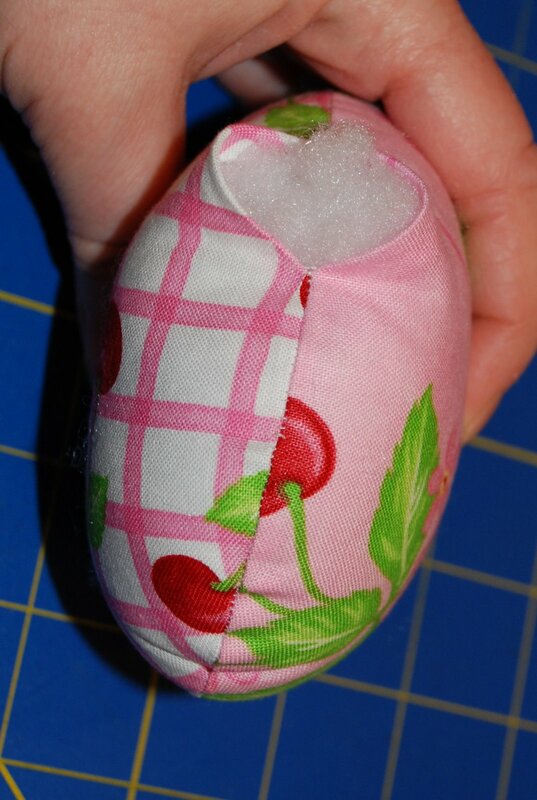 I trim to about 1/8 inch, with the tight stitches it is unlikely the stitches will pull out. 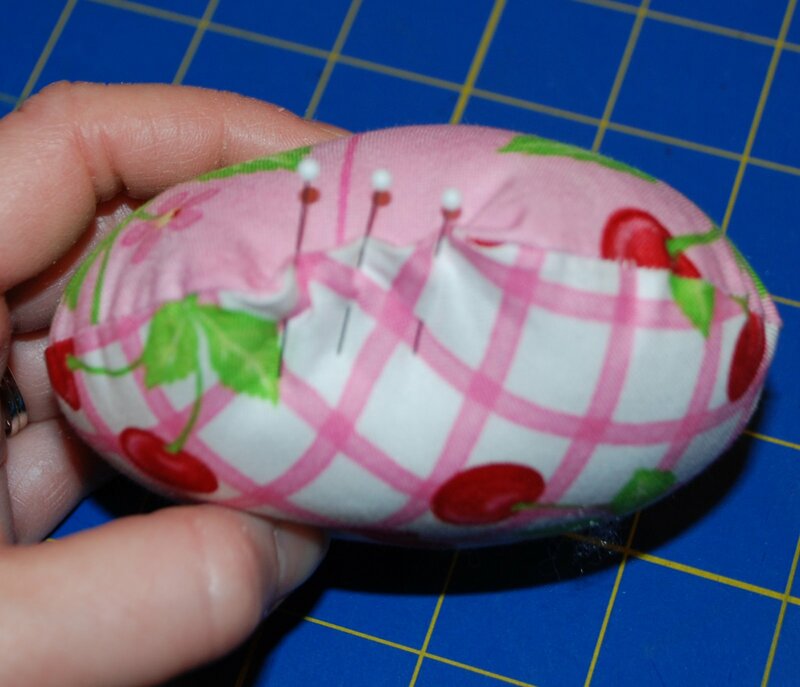 Next, turn pincushion right side out. Stuff very full…or use walnut shells. This step takes patience. 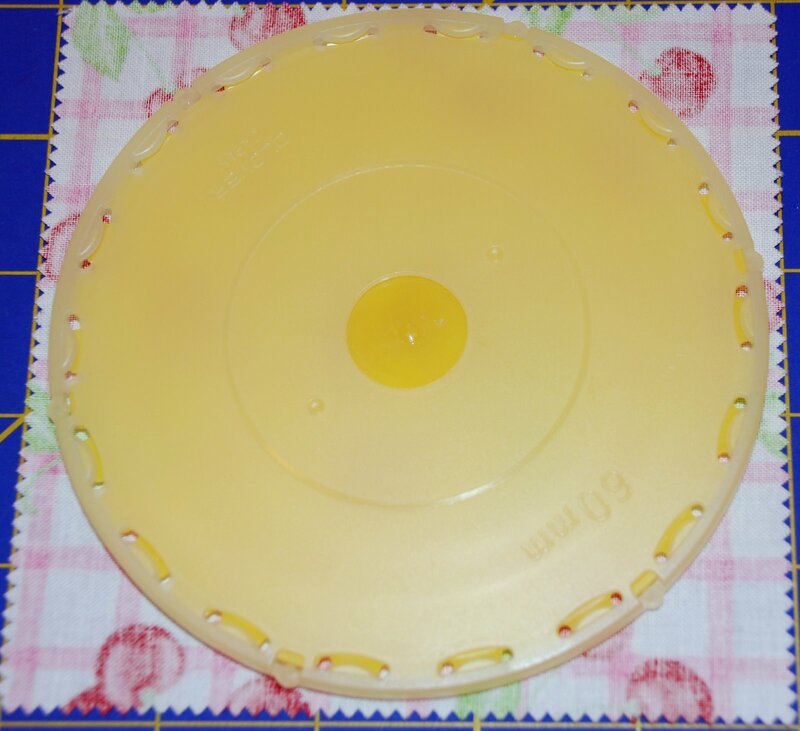 I turn the openings in and pin atleast 3 places. You want to align the edges as closely as possible. I sometimes find myself repinning 5 times or more. Then using the silk thread, wip stitch opening closed. 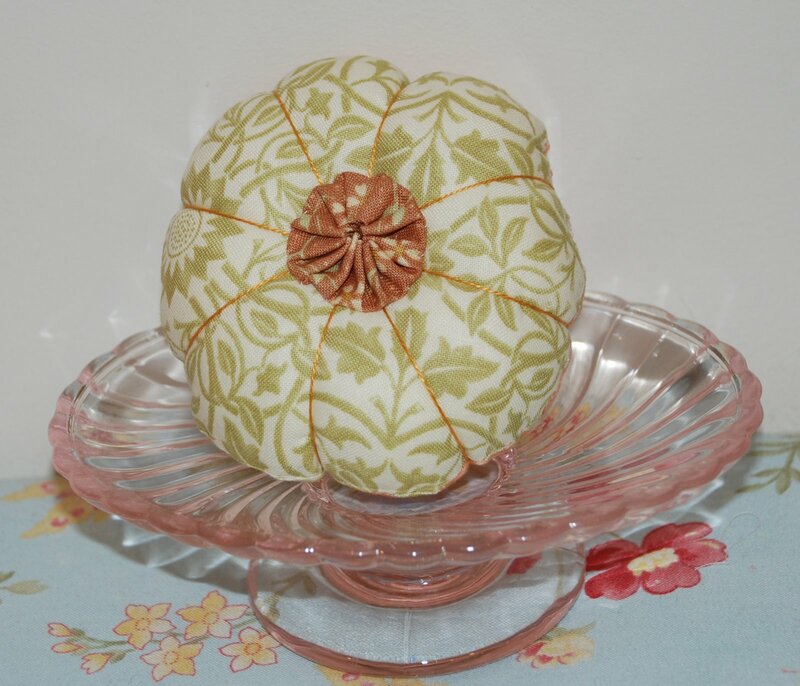 To give your pincushion more personality…chose a pearl cotton size 8 to coordinate. 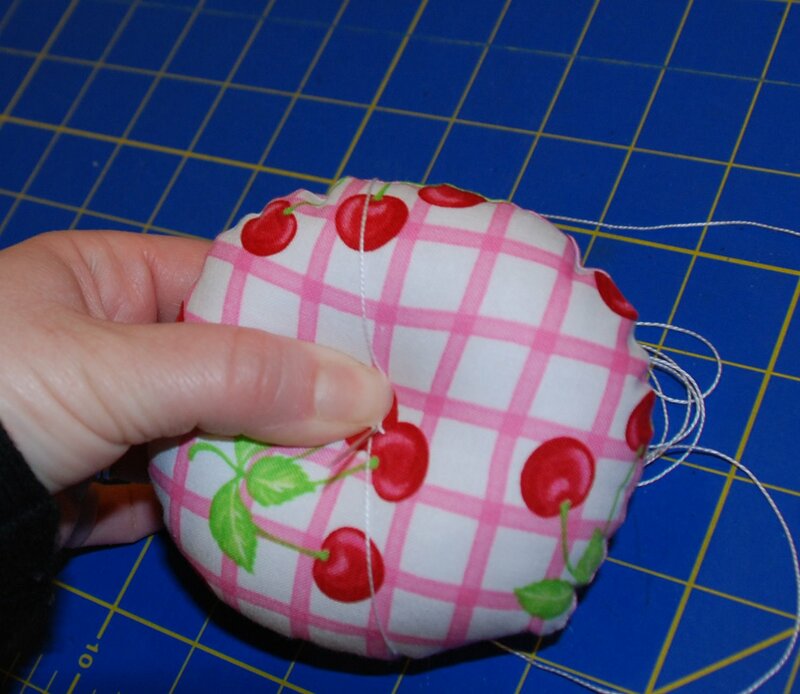 Knot one end of the pearl cottong and draw up into the center of the pincushion. 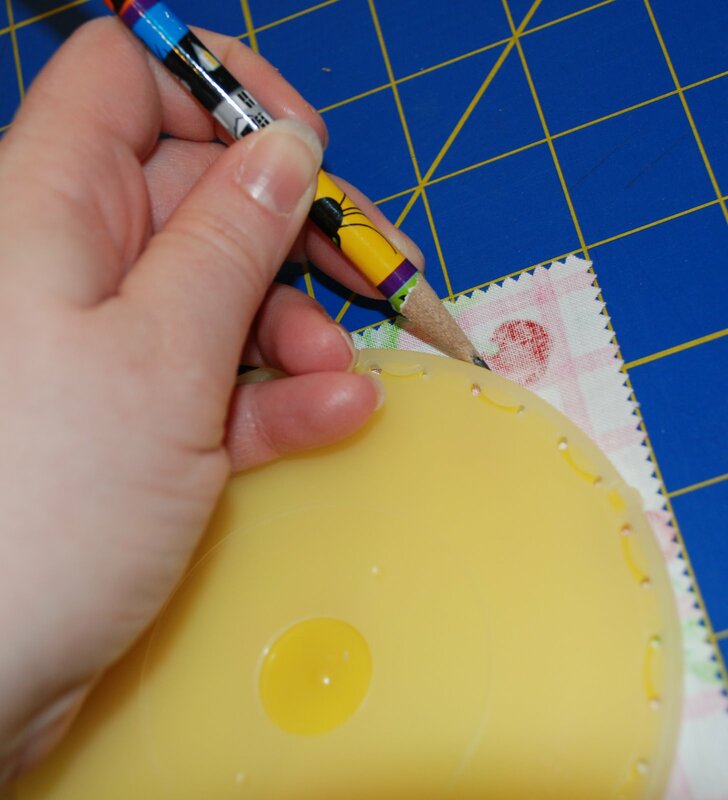 I use a doll makers needle as they are longer and stronger to pull through the stuffing and fabric layers. I proceed to up and over the sides of the cushion 6 to 8 times, pulling taught with each pass. I finish off my thread end on the side of the cushion in which I started. In effect there are 2 knots there. I use a button or yo-you to cover my knots and center. 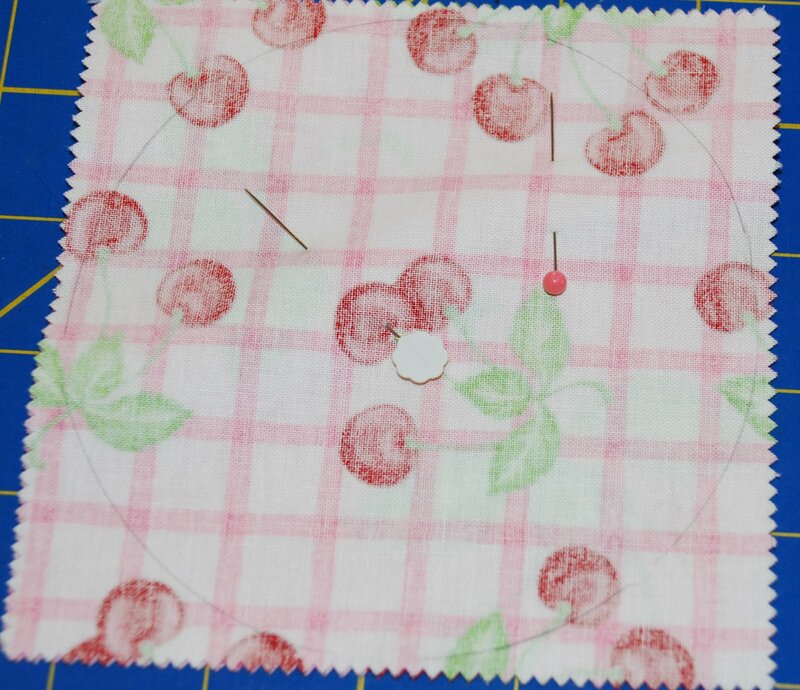 Here’s an example with a yo-yo center…..
A charm pack can make several pincushions…depends on the number of charms in the pack. 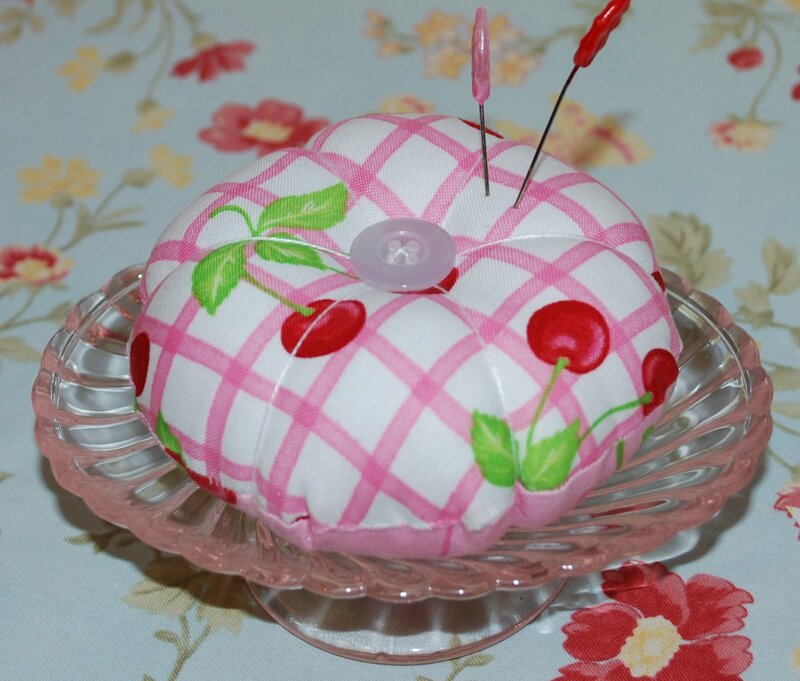 I have also used extra charms from finished projects for these pincushions. 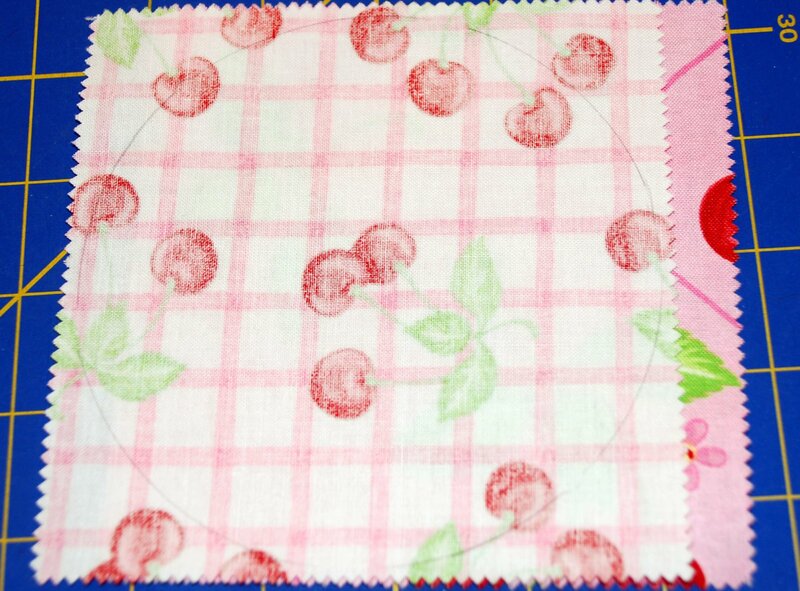 This entry was posted in Charm Pack, Easy, Stuffed Stuff and tagged Me and My Sister, Oh Cherry Oh. CUTE!!!! 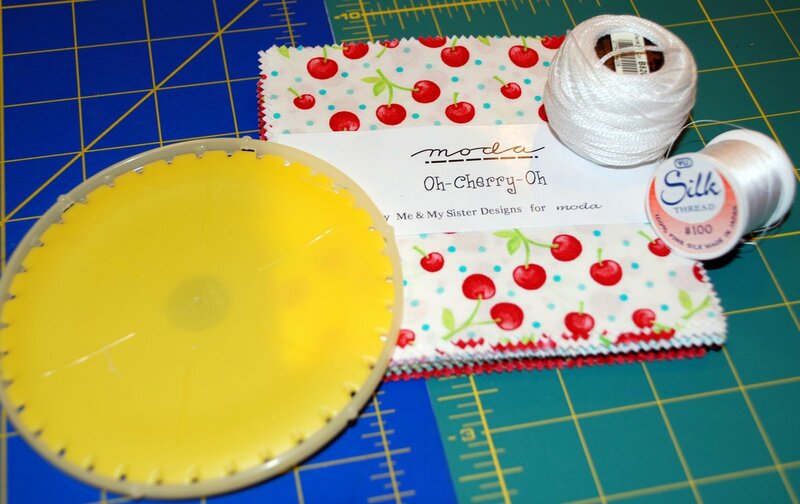 LOVE the cushion with the YOYO… You are so clever! Very cute! Looks like it would be fun to make too. That ROCKS Vickie! So (sew!) simple. I LOVE it. I am sooo going to make one this weekend. I am determined! Vickie, I just love this one!! You know I just don’t have any charm packs…LOL! 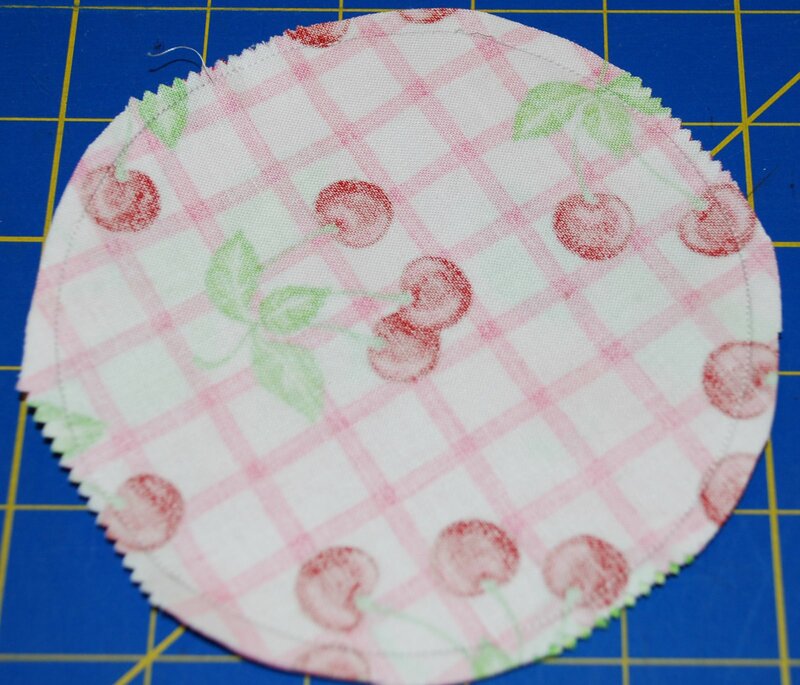 SEW cute Vickie – I love it! You are the pincushion queen! And now Abba is singing in my head.